If you’ve ever heard of a diet that promised to give you more energy, New Jump Swing is the program that delivers 100% on that promise. Backed by more than 39 years of experience coupled with clinical documentation as well as world record demonstrations, New Jump Swing is a healthy aging program that combines the best in diet, fitness and motivational psychology. This book is the revised and updated version of two of Thomas’ world record speeches. Those speeches were titled “The history of herbs in maintaining physical fitness “and “Vegetarian Athletic Nutrition”. It also includes his record setting jump rope cross training fitness program. 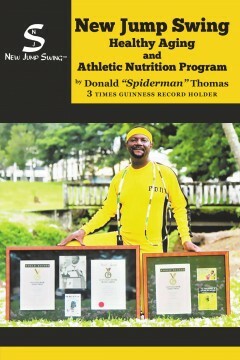 Pioneering champion and three times Guinness record holder Donald Spiderman Thomas, has overcome great adversity in the development of his healthy aging and athletic nutrition program. From bilateral knee disease and surgery to respiratory illness, he has conquered them with a winning attitude, fitness and nutrition program that is contagious. Born September 21, 1953, he exudes the energy that he promotes his New Jump Swing program will give the reader. In the highly competitive anti-aging, diet and fitness “Game of Thrones”, he is the one with three dragons.